Everyone has their preference on what type of eyeliner to use. 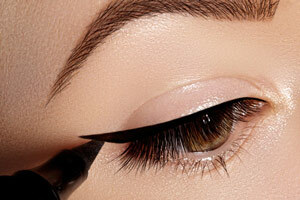 The most common types of eyeliner are pencil, liquid, and gel. Picking out the right eyeliner color is just as crucial as deciding the medium of the product. The most common colors used are black and brown. Other colors should not be underestimated though, as they can enhance your eye color. It can also be fun to try bright and crazy colors, especially when going out on the town. You can also find eyeliners with a little bit of sparkle, glitter or a metallic hue. Pencil eyeliner may be the easiest to use to achieve a perfect thin or thick line. Also, it may be hands down the best to achieve a defined waterline and lower lash line. A Pencil is very versatile in many ways, especially because it can be used to look natural, bold, or smudged. Liquid liner is best used for a dramatic effect. It is ideal for the always beautiful winged eyeliner look or cat eye. It is used to create both thin and thick lines, both are rich in color and won’t go unnoticed. It is sometimes trickier than the others to use because it tends to run or smudge easily. When it is used with time and precision, it makes for truly stunning eyes. Try practicing this technique until you achieve amazing results. Gel eyeliner with a petite angled brush gives amazing definition to the top lashes. It assists in moderate definition, as well as a subtle eyeliner look. It is the perfect combination of soft and bold. It makes eyes stand out but does not wash out the face or look too harsh. What is your favorite type of eyeliner? What is your favorite eyeliner color to use daily and for going out for special occasions? Are you an eyeliner application pro? Let us know by sharing below!